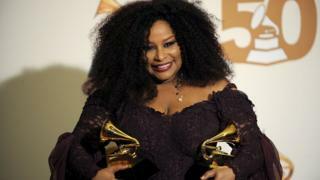 Chaka Khan is officially back. Mind you, she's one of those artists who has never really gone away - such is the breadth of her back catalogue. Along with her big hits, there are the songs you didn't realise were even sung by her; the covers by newer artists in ode to her; and the samples used on tracks by the likes of Kanye, Eminem, Bryson Tiller and Stardust. But despite having recorded, by some estimates, over 2,000 songs - I Feel For You remains her only UK number one. The 1984 track is the one starting "Ch-Ch-Chaka Khan" - which is the first thing anyone could say to me when I told them I was interviewing the star. I ask the 65-year-old Queen of Funk whether it annoys her when people say it directly to her (as if they dare). "Yes. Yes it does," she says unequivocally. You must have had it for over 30 years now, I tentatively suggest. "Yes - and I'll have it for the next 50 as well... sure," comes the response, before conceding: "It was a great track. It's a mixed blessing - like many of my songs are." I Feel For You was itself a cover of a 1979 electro/synth album track by Prince, before being turned into a beat-laden R&B/hip-hop crossover anthem. Khan - real name Yvette Marie Stevens - later went on to work with Prince when he produced her ninth studio album Come 2 My House in 1998. "He was a genius," she says of the late musician. "It was amazing and I'm so thankful that I got to work with somebody who was so like-minded, musically. "It took us two weeks to do that whole CD - which is an indicator of how brilliant he is." Khan reflects on her relationship with the Purple Rain singer: "He was a good person. We were like brother and sister and loved each other very much. You miss people like that always. "I thought that about Aretha [Franklin] too. That if Aretha ever left, the world wouldn't be the same, and it isn't. It feels very different without her on the planet." In fact, the last time we saw Khan, she was singing a powerful nine-minute rendition of gospel song Going Up Yonder at Franklin's funeral. Many media outlets reported on the fact Khan had the words of the song on the back of a fan she was holding. "That was not supposed to be the focus," she says forcefully. "The focus was that I was there to pay my respects to my sister, before she went off - not that I had to put my words on the fan. "It's so trite," she adds. "How sad this business is that we're in when people force themselves to ponder and to focus on something like that at such a momentous time." She explains the aide-memoire had nothing to do with nerves or the fact the song was unfamiliar: "I've been singing this song a hundred years, but I just never learned all the words because I don't sing at funerals often." Khan says she was close to Franklin but appears philosophical about her death: "We were friends. We loved each other," she says. "It's always sad to lose someone - or to know you're not going to see them any more in your life... on this earth. "But actually death is a part of life. She fought and fought her sickness for many years and it's time to just give it up and relax - just go home. "I was just focused on giving her a good send-off," she adds. Listening to her performance at Frankin's funeral, it's clear Khan is one of those rare singers whose voice sounds just as amazing now as it did 40 years ago. "I don't have any magic potions," she promises. The I'm Every Woman singer puts her amazing talent down to "a lot of rest and the grace of God". Over her extensive career, Khan has covered almost every genre and is now releasing her first album since 2007, in collaboration with DJ Switch. The former member of Major Lazer has produced tracks for Beyonce, M.I.A. and Santigold and has now added Khan to this illustrious list, after producing her new album Hello Happiness. Last summer the lead single from the album - the up-tempo, modern-day disco track Like Sugar - was released and quickly became a tastemaker favourite, with the likes of DJs Pete Tong, Annie Mac and The Black Madonna all featuring it in their setlists. The rest of the album possesses Khan's hallmark funk sound - but with an updated almost Ronson-esque twist - especially on track Like A Lady. "We just met in the studio, it was very simple," she says on how the collaboration came about. "We happened to bump into [Switch], working in the studio where I was rehearsing some tracks. "[I] liked what I heard, and thought 'Ooh let's put something down together... let's see what happens' and we did and I guess we were lucky..."
Khan was indeed lucky, as prior to working with him she'd never heard of the British producer behind hits including Beyonce's Run The World, and Alex Clare's Lateness of the Hour. "I don't listen to music at all," she admits. "Because that's my job. Do you go home and do interviews with your cat? The last thing I do is music when I'm home." Instead, she says her favourite thing to do in her spare time is to curl up in bed and watch classic horrors on Netflix. So will Chaka's 12th solo studio album be the one to finally see her inducted into the Rock and Roll Hall of Fame? She's been passed over five times altogether now - having received three nominations with the band Rufus (including this year) and two as a solo singer. "I don't really care about the Rock and Roll Hall of Fame," declares Khan. "Frankly, Scarlett, I don't give a damn," she says, referring to the famous line in Gone With The Wind. But in the next breath, it does seem to bother her: "It'd be nice for it to come to an end, y'know. It's a little like dragging the dolly in the dirt, right now. It's a bit much. Over and over this recurring nightmare..."
Perhaps more as an affirmation to herself, she adds: "I don't do this for awards. I don't do this to be in the Rock and Roll Hall of Fame. I don't do it for those reasons, so that's why they don't mean a lot to me. "I focus on the task at hand and try to stay in the present time." Surely, it's nice to have 10 Grammys under her belt though..? "I wouldn't know if I had one or 10," she retorts. "What difference does it make in the scheme of things? Realistically? "I'm not trying to be mean about it. If every time I won a Grammy, my ticket price went up a million dollars, then, yeh, it would have great meaning to me. Or more meaning to me, shall we say," she adds, laughing.